Fleeing from an abusive stepfather, fourteen year old Jason McCormick finds refuge in a remote native community in Northern Canada. Befriended by Shanny Rupert and his family, Jason soon realizes that the people of the Sandy Narrows Reservation are in the midst of a crisis of their own. Despite government assurances to the village, a logging company has marked a two-hundred year old stand of timber for destruction. The huge white pine trees have played an important part of the communities lives for many generations, and the local villagers have vowed to do everything they can to protect their heritage. Jason and Shanny are swept into a bitter battle to save the giant trees from being cut down. In the meantime, Jason's stepfather (Eli Palmer) has formulated a murderous plot to eliminate his stepson and gain sole possession of Jason's inheritance. Set in the wilderness of Northern Ontario, Canada. 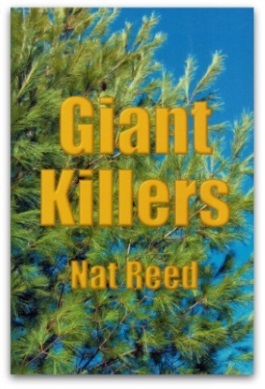 Giant Killers contains a challenging message for young readers and a captivating plotline, as well as a unique cast of unforgettable characters. Nat Reed was an elementary teacher/principal for nearly 30 years and then taught full-time at Trent University's School of Education for another nine. Nathanael has had 60 curriculum units published and more than 150 popular Novel Studies available online, these are also available in such outlets as Chapters and most stores for teachers. Nathanael lives with his wife, Joyce, and has four sons, Nathan, Jason, Eric and Joel who also reside in different areas of Canada. Please visit our novel study website at www.novelstudies.org to find more of our work and educational resources. All of the items purchased on this website and Reed Novel Studies make use of Pulleyapp and PayPal in order to complete each transaction. That means all of the purchases made through our websites are secure. © Copyright 2010-2019 by Reed Publications. All Rights Reserved.